In French there is an expression, sabrer le champagne, which means to open a bottle of champagne with a sabre. Before last night, I had never seen this trick performed in person. Sabrer le champagne is easily enough translated into English, but English possesses no equivalent expression to describe this wondrous spectacle, except the ultra-technical term sabrage. The French phrase has more of a joyful ring, especially given its homophonous similarity to the expression sabler le champagne, which means to celebrate by drinking champagne. 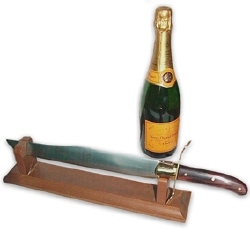 Why uncork a champagne bottle with a sabre? There is only one reason that I know: for the rapture of it. We looked over at the open kitchen and there stood Daniel Rose, dressed in black, with a sabre à champagne in his hand. (Yes, there is a specialized tool for this technique, although apparently any blade will work.) I watched as Rose drew back the tasselled blade, then in a swift stroke running parallel to the bottle (pointed away from the dining room) he knocked the lip, with cork inside, clear off the neck. I laughed in delight. I felt enchanted, exhilarated, elated and transported: in a word, rapturous. Recently I blogged about the Lost Generation writer Kay Boyle’s “rapture for cooking” – the intense sensual pleasure that this bohemian woman took in the kitchen. Boyle paired her passion for love affairs with a hunger for fine food, proving that the whisk and the pan need not be the tools of domestic oppression. She was a woman of liberated appetites. But pathbreaker that Boyle was, she followed by more than a generation the first American woman food writer to recount the raptures of the appetite. Elizabeth Robins Pennell was born to a privileged family in Philadelphia in 1855 and schooled in a Catholic convent. 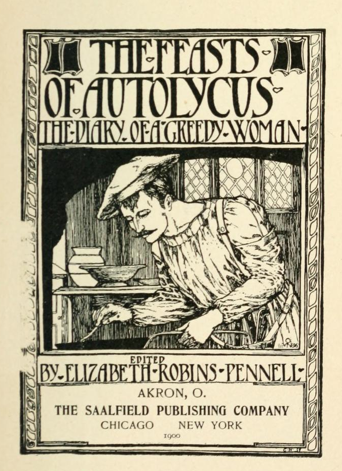 Discontented with the expectations for women of her generation and social type, Pennell used the pen to author her escape. She published her first book, a biography of the pioneering feminist Mary Wollstonecraft, in 1884, then married her illustrator, Joseph Pennell, and moved with him to Europe. The couple traveled throughout the continent by bicycle, and lived for decades in London, where they held a weekly salon attended by Oscar Wilde, Henry James, and George Bernard Shaw. As Joseph made a name for himself as an illustrator, Elizabeth began writing a food column for the Pall Mall Gazette. Most of us don’t have Elizabeth Robins Pennell’s facility for finding rapture on the plate. I rarely find it in anything I’ve prepared. Either I’m too self-critical or not good enough a cook. I am more likely to experience it in meals prepared by le rosbif. There’s something about being cooked for by someone who really cares about your pleasure, which is one reason I tend to prefer home cooking to restaurant meals. Most restaurants, of course, are driven primarily by the need for profit, and the food reflects that economy. But from the moment that sword struck bottle at Spring, the care that the restaurant took in our pleasure as guests made our meal there a delight. Just to be up front, I should mention that Spring invited me to make a reservation after I blogged about an event where I heard Daniel Rose speak on the state of French food. But we came as ordinary guests, paying for our meal like all the other diners, who seemed to be treated just as solicitously as we were. This was by far the most expensive meal we’ve yet eaten in Paris, and we can’t afford many more like it. That said, the meal was absolutely worth every penny; in fact, considering the quality of the ingredients, and the ratio of staff to diners, it’s hard for me even to imagine how the restaurant can turn a profit. But enough about these practicalities, what matters is the rapture on the plate. 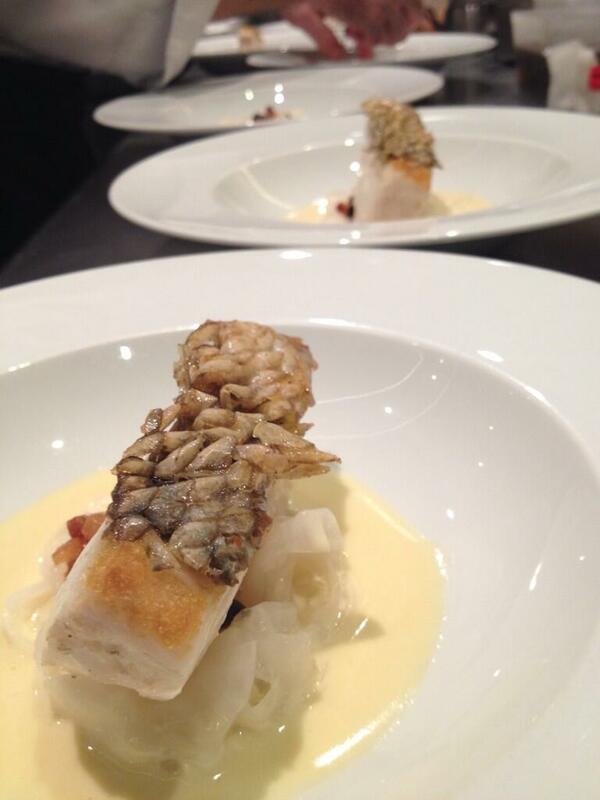 There were, by my best recollection, six courses. We began – following the champagne – with hors d’oeuvres, three small tastes to wake the appetite. We had oysters with a seaweed granita and little scissors of seaweed on top (wonderfully sweet and salty, could have eaten a plate of these), a fried morsel of tête de veau (veal’s head) with a creamy tartar-like sauce gribiche (powerful umami, decadent and rich), and a small plate of marinated mushrooms with horseradish shaved on top (I love all things pickled, these were bright and tart). The hors d’oeuvres, in other words, stimulated all the tastebuds we would be using during the meal. Next came a dish of seared scallops with tiny slivers of apple and jambon de boeuf, a cured beef from Galicia similar in style to Spanish ham. A point of disagreement: this was le rosbif’s favorite dish, and my least favorite. Our disagreement can be explained by le rosbif‘s greater sweet tooth – he’s English after all. Le rosbif – who typically does not like scallops – found the dish wonderfully fresh, tender, and toothsome; for me, the sauce was too sweet. Well not so sweet that I didn’t eat it all up. Just if I had to rank the dishes in order, this to me was the least interesting. My favorite dish was the one that followed: seared bar with a creamy choucroute (Alsatian-style sauerkraut) made of radish flecked with tiny morsels of lardons and szechuan pepper, I think. Choucroute is a very common fast food at the Paris markets. A lot of boucheries prepare enormous pots of the dish – heaps of sauerkraut studded with sausages and various inexpensive cuts of pork, like hocks – which they sell alongside their pâtés en croûtes (meat pies) and other prepared dishes. As I mentioned above, I love pickled dishes, so the smell of choucroute always beckons me. But I am not so keen on sausages. I only just discovered that there is an alternative choucroute de la mer, prepared with fish, kind of like an Alsatian paella. Now I worry that having had Spring’s interpretation, the others will be ruined for me. Following the fish came duck three ways: a magret (breast), cut from a foie gras duck, served with a red wine sauce; a sizzling dish of seared foie gras and mushrooms; and a kromeski, which is a Polish croquette, in this case made with duck and more foie gras inside. Oh, foie gras. How much do I love foie gras. I am devoting this year to eating foie gras. I order it all the time, often on salads (that makes it virtuous!). I eat it cold on toast with salt. Unfortunately, I couldn’t try the sauce that accompanied the duck breast, because I have a red wine intolerance that has made too many evenings at nice restaurants end badly for me. But luckily I had foie gras to slather across the meat instead. As for the kromeski – I found it very exciting since I had just learned about this dish from Elizabeth Robins Pennell. She ends her chapter on spring chicken with the advice to “braise your chicken, fricassee it, make it into mince, croquettes, krameskies; eat it cold; convert it into galantine; bury it in aspic; do what you will with it, so long as you do it well, it can bring you happiness and peace.” Daniel Rose seems to have taken the same approach with duck, and it served him well. At some place in this parade of dishes, I forget exactly where, came a salad of parsley and radicchio. The parsley were in big leaves, full of peppery flavor. There was also a braised endive with the duck breast. I love bitter lettuces, so these leaves made me very happy. If anything, they could have been even more bitter for my taste. After our duck we opted for a cheese course. Because, really, when you’re in a state of rapture, why stop short? There was a plate of thinly sliced 36-month comté with tiny crystals in each smooth mouthful. This was the only moment in the meal when I felt bad for leaving the kids at home. My son looooooves comté. I thought about sneaking a slice into my purse, but they all got eaten before I had the chance. There was also a beautiful blue fourme d’ambert. I had bought a slice of this cheese earlier in the week at fromagrie Beillevaire, but I never grow tired of it. This cheese, apparently, dates back to the Roman times, so I count on being able to enjoy it for the rest of my short years. We also had a runny cheese and a hard cheese, I forget which, maybe a tomme du berger? We ended with coffee. At least I ended with coffee, le rosbif ended with brandy. The coffee was very piquant – I don’t take milk or sugar in my espresso – zing! It came with a little coffee-cream puff, so I had a touch of sweetness. Then I noticed that the clock was striking 12:00. The kitchen was packing up and I thought we should clear out and let those good people go home to bed – or if they’re anything like most chefs, go out drinking and eating at some after-hours venue. Back in September, when I heard Daniel Rose give his talk at the American Library, I was struck by his account of the thought that he put into a single dish of mackerel with smoked tomatoes that was intended to capture the changing of the seasons during the week in which it was served. He drew on logic, philosophy, and history to design a dish whose effect was straightforward and sensuous. He produced rapture on the plate without requiring his guests to be conscious of his wit. Our meal on Saturday night achieved the same effect. Each dish surprised me – there is no menu at Spring, the kitchen serves the same set menu to each guest, taking allergies and aversions into consideration. But I never had to think about what I was eating, as one is encouraged to do by restaurants using pyrotechnical molecular gastronomy. Only afterwards, in talking over the meal and writing up this account, have I thought about the underlying design behind our menu: the previewing of the tastes in the hors d’oeuvres; the slight twists on traditional pairings (scallops and a hammy beef; radish in the fish choucroute; ginger with pear and apple); the way in which the apples, pears, persimmons, radish, and mushrooms, captured the best of late November’s market; the use of pickling and the caloric richness showing faithfulness to the cool grey season (I am willing to bet that meals at Spring during its eponymous month are lighter and brighter). 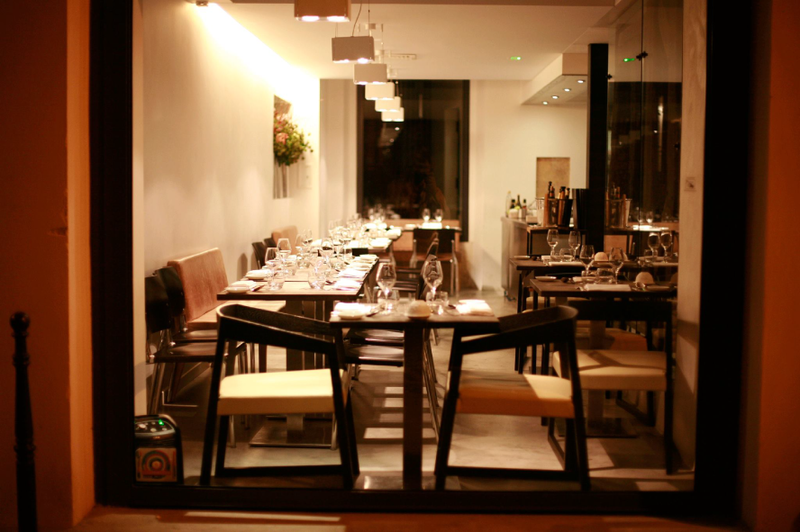 A final thought: is Spring a French restaurant? Even if the English name and American chef suggest otherwise, the attention to terroir and the use of traditional French ingredients like foie gras certainly make it seem so. I know Rose has married a French woman, and France seems to be where his heart lies. But most of all, to commence a meal by sabrant le champagne makes a very loud declaration of the joie de vivre, or rapture in appetite, that marks the keystone of la cuisine française. What an experience! Somehow even better with no pictures. The imagination gets a chance at last. Everyone should open their champagne this way. The odd amputation and decapitation here and there is a small price to pay for style.